This month we moved into our new home. I feel like a kid in a candy store, so many rooms to decorate and projects to do! I’ve had these ideas in my head for months and they are finally coming to fruition. My first project, kind of out of necessity, is my daughter’s play room. We actually have a whole room dedicated to her toys, amazing! 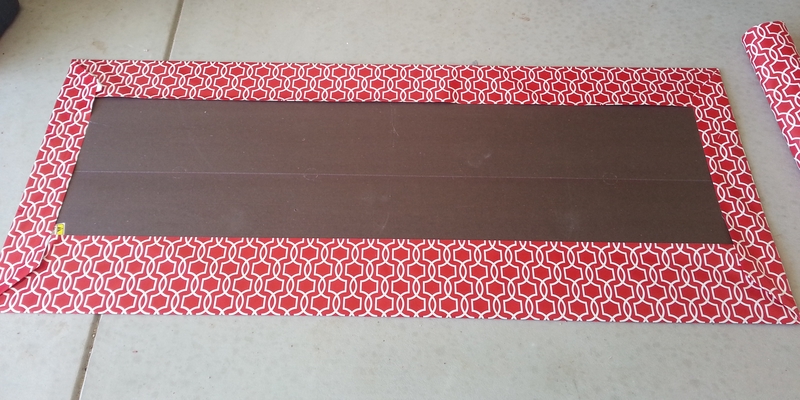 I’m sharing all the details on how to paint laminate. I want to share this room with you piece by piece. My plan is a primary colored fun room, something I am too scared to do in a bedroom. But to keep it temporary I’m not painting the walls, just pops of color everywhere. To start I am going to Paint Laminate Furniture! 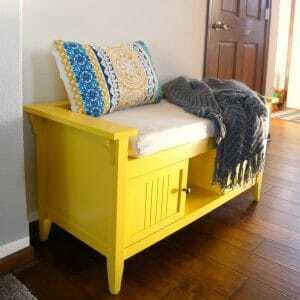 It’s possible and is a great way to bring life to old dull furniture. This post contains affiliate links, you can view my full disclosure here. I got this bookcase second-hand and it lived in the basement of our old house. It has good bones but wasn’t pretty to look at. 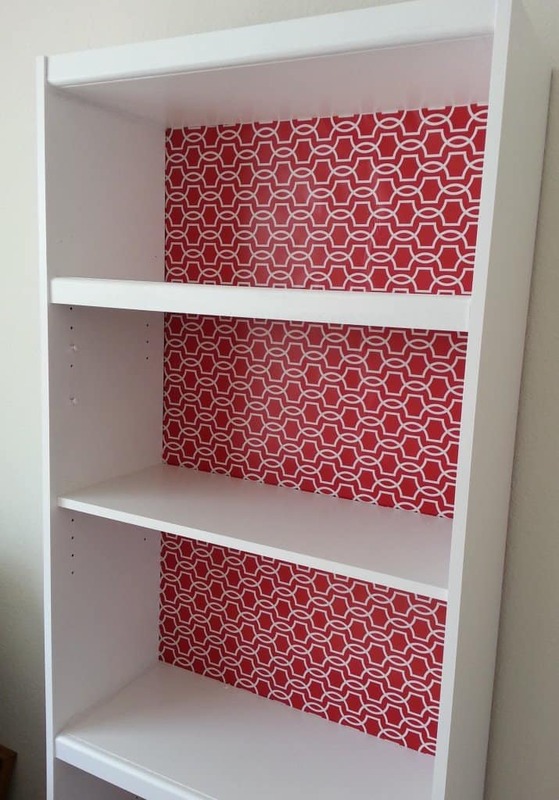 This is a laminate bookcase and YES you can Paint Laminate Furniture. I did some research and asked some questions to make sure I did this right. The blog I found that made me say “yes I can” is here. Check her out. 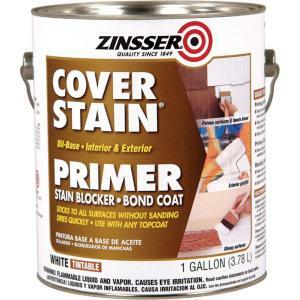 Primer, specifically Zinsser Cover Stain Primer. Get yours here and read on to see why this is THE product to use. I started by cleaning it and removing the shelves and back. There is one fixed shelf in this piece that stayed put. To prime it, a necessity, I used Zinsser Cover Stain Primer. Laminate is glossy and this thick sticky oil based primer works great to cover it up without sanding. A primer is key to a smooth paint-able surface. Since this is oil based it doesn’t clean up easily so I purchased a cheap roller, pan, and brush; about $5 total. That way I could throw it all away and not worry about the clean up. I did end up with a few splatters on my hands that scrubbed off in a day or so. I primed away using the roller for the large flat areas and a small brush for the corners. The primer dried quickly and I was able to move on to the paint after an hour. 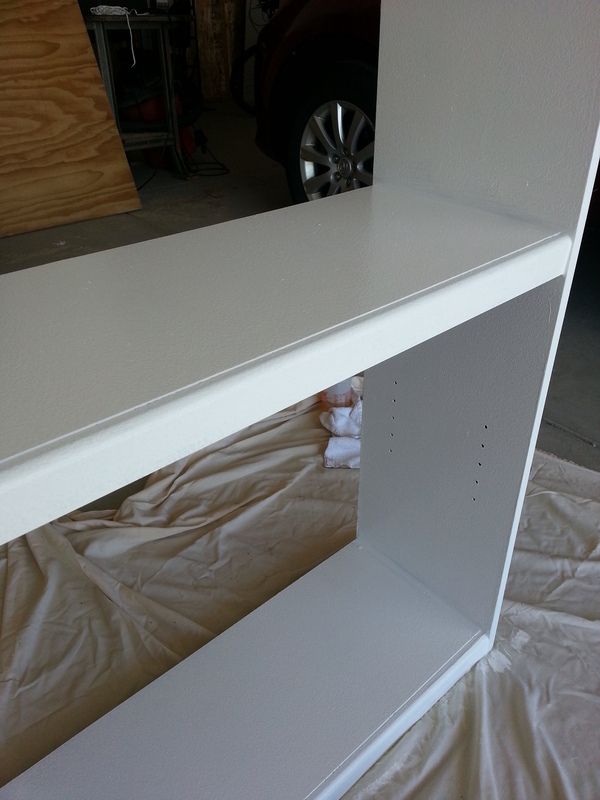 I chose an ultra white semi gloss latex based paint for the finish. For this I used a nicer roller and brush, I was able to clean them up afterwards. A good roller and brush won’t leave residue behind. I did 2 coats, letting the first dry about an hour before applying the second. The result was a smooth, slightly glossy finish, so much better than fake wood brown. Next up was the back. 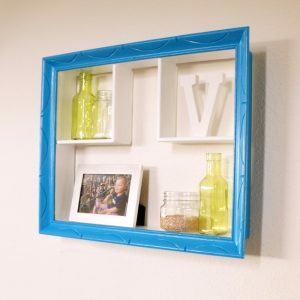 On this piece, and most inexpensive bookshelves, you have a piece of flimsy wood that is nailed to the back. I removed this and covered it with a bold wrapping paper. I bought this paper on clearance many January’s ago intending to use it the next Christmas. I love it but just never got around to using it. It was destined to be a focal point in the playroom. 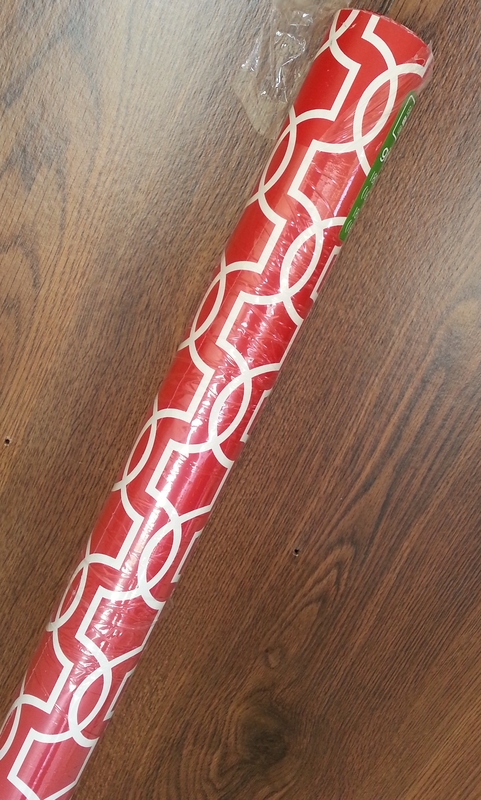 I laid a long piece of wrapping paper on the floor and laid my backing on top. Then I “wrapped” the back and secured the edges with hot glue. This paper is thin and down the road will probably tear. But it’s easily removable and can be swapped out for another style when I ready for a change. UPDATE – this paper has not torn and we are 4 years in. This bookcase gets a lot of use too. Then I reattached the back, mounted the shelves, and the bookcase was ready for the room. It’s an awesome first piece. This room is really a blank slate. Next up..some colorful eclectic wall art. Stay tuned! You just became my new BFF! 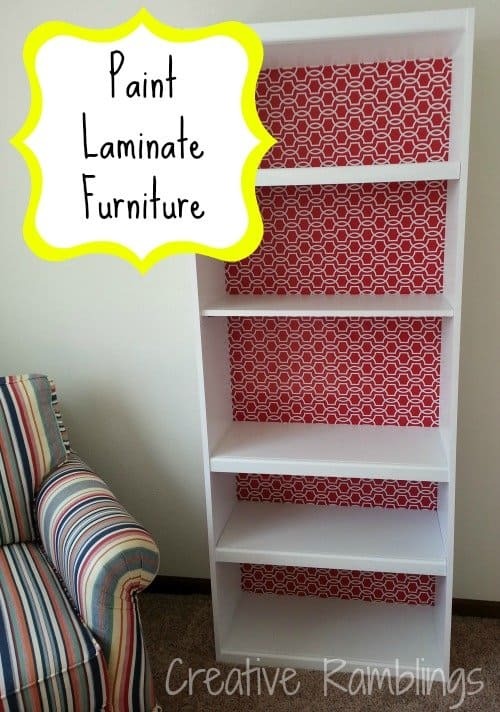 LOL I have two laminate book shelves I want so desperately to paint…but have too afraid to do it! Thank you so much for doing this before me 😉 Love the Blog too! Stopping in From The Weekly Creative Link! Aw thanks! I felt so empowered after doing this. You can do it! Good luck and thanks for stopping by. My thought EXACTLY!!!! Everything you have said. So doing it!!! Thank you so much! I’ll head over and check out your party. I’m not an expert by the primer I used is made to cover just about anything. I say got for it! Hope you come away with something you love, good luck! I’ve had mixed results painting laminate but maybe it’s because I didn’t use the right primer. Love the paper you used! What a great transformation! Thanks Jenna. This primer did the trick for me, there is no way the paint would have stuck without it. That’s awesome Katie, good luck! I’d love to see it when you are done. I think a nice piece of cloth (old curtain or sheet maybe) would work just as well as the paper. Beautiful though. I agree, there are so many possibilities to line the back. Thank you for stopping by today! how do you protect the paint from peeling when things are set on the shelves. I have read a lot about latex paint coming off when used on areas where things will be placed on them. Would you need to put a top coat on the shelves? You can put a top coat over the paint to seal it, however some paints do not require that. The paint I used was semi gloss and has held up extremely well. This bookcase is in my playroom and gets a lot of use. How does this piece look after years of use… did the paint scratch or peel? Also, what brand of paint did you use? This piece has held up really well, it’s been in my girl’s playroom for almost 3 years now. There are a few minor scratches where they keep their heavy toys on the bottom shelf but the rest looks fantastic. The primer is the key, on top of that I used a Behr white paint. This is so timely as I’ve been preparing myself to part with an item and in it’s place put a tv table. I have an old entertainment center taken apart and put away and was gonna put it in a garage sale, but now I’ll re purpose it with your painting tips. Question, how much of the primer did you end up using for the bookcase? I’m trying to figure out how much I’ll need to buy. Thank you for posting this! I am so glad you found this helpful Amy. For this bookcase I used maybe a quarter of a gallon. I didn’t have to paint the back (it’s cardboard) or the underside of the shelves. Hope that helps. Have fun with your project. Thanks for the great tutorial. 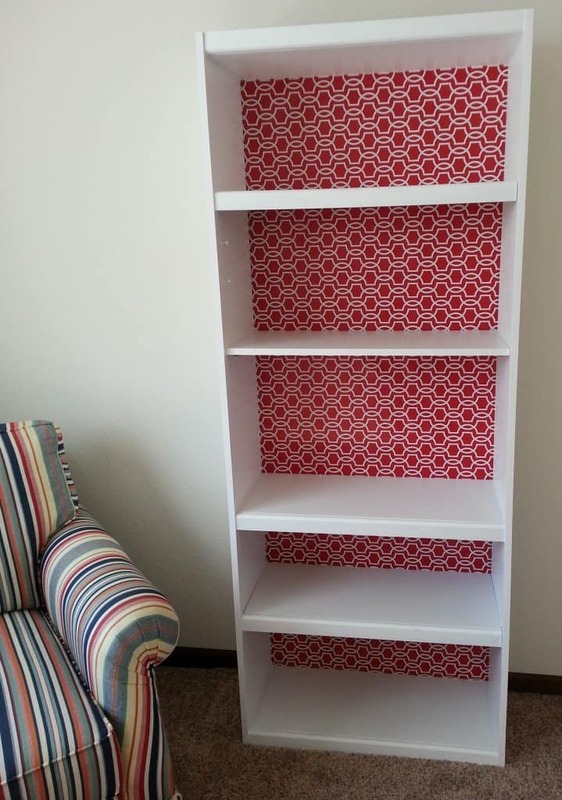 Your bookcase turned out so beautiful that I felt inspired to do mine as well! It turned out awesome! I used contact paper for the back but that was the only change. Love it! Thanks again. I am so glad to hear that Erin, contact paper is a great idea. Thanks for coming back to share your success! 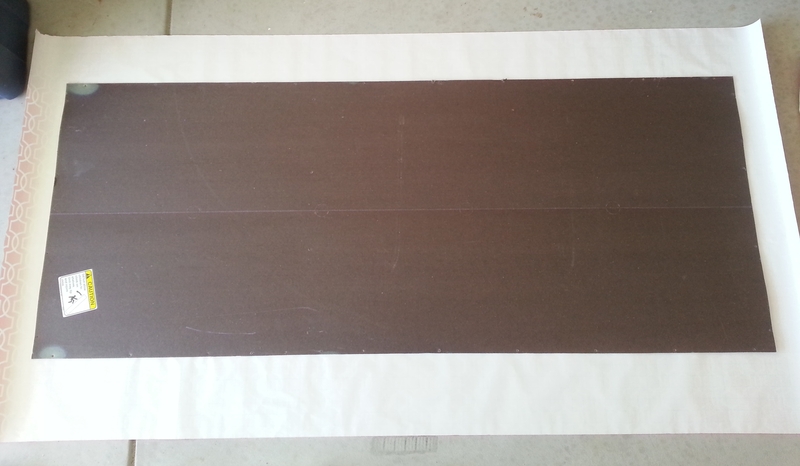 I just painted a cheap choc brown laminate bookshelf satin white. I used undercoat first then a 2in1 primer and colour. 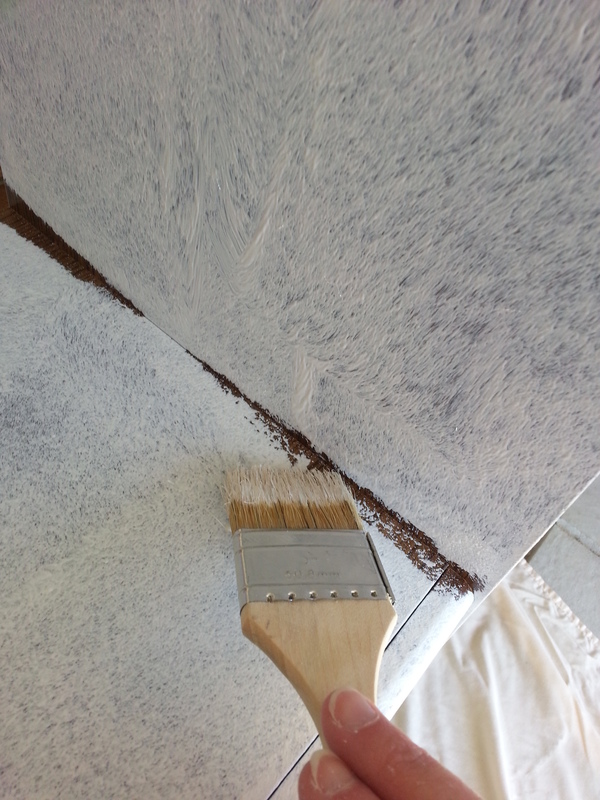 The finish is sandy like and chipped so easy when i was reasembling it. Can u tell me wat i did wrong please? Im wanting to paint my kitchen cabinets white also. Sorry that happened to your shelf. 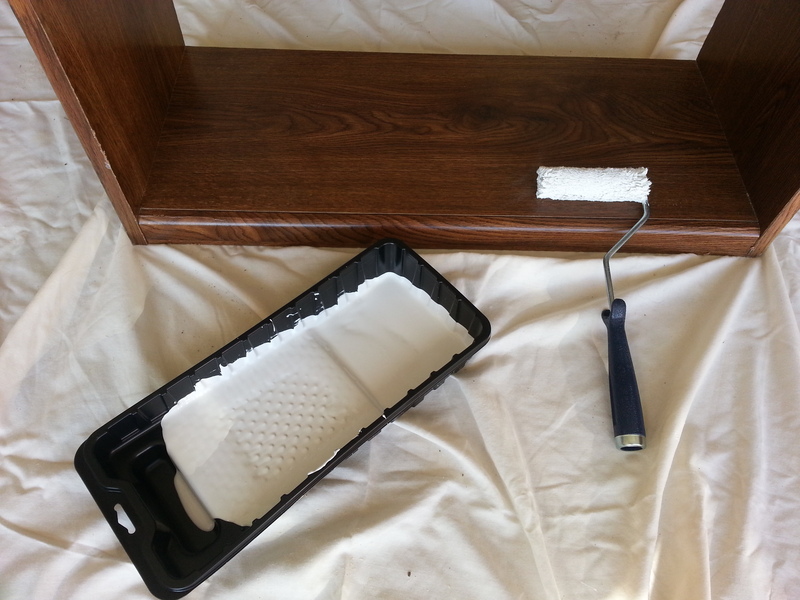 When I paint laminate I start with an oil based primer like the one in this post. It sticks to the laminate really well. A water-based primer will not work as well. Then I would top with a white paint. For both coats use a very thin layer of paint and add more to cover as each layer dries. If you are still having issues you can always check with you local paint store where you buy paint, they can be very helpful. Best of luck! I think everyone has one or two of these brown laminate bookcases. I redid a few of them and used chalk paint. I think they can all stand a refresh to get away from all that brown. Love what you did with the background. How many coats of primer did you use? I did a laminate bookcase very similar to yours, but apparently didn’t use right primer or enough of it. The frame and fixed shelves were spray painted and have held up well but the removable shelves were hand painted on top of paint/primer and they have peeled. 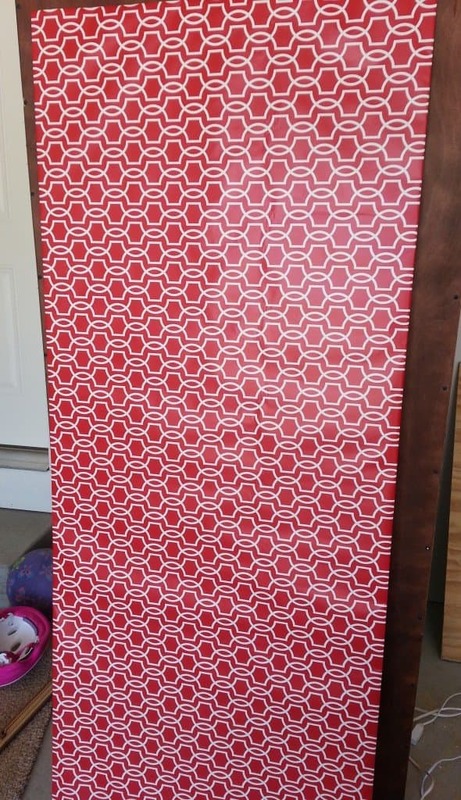 I used wallpaper on the back that I got at my local Habitat ReStore for $1 and it looks great! I’m glad only the removable shelves are giving me a problem, that’s an easier fix. Any suggestions on removing paint from them without removing laminate itself? Hi Terry, sorry your paint is peeling but yes glad it’s only on the removable shelves. For mine, I used 1 coat of primer, 2 in some tough to cover spots. It’s key to use an oil based stain covering primer that will allow the top coat to stick to it. As far as removing it you could try scrapping very carefully. If it’s already peeling that might be a good option. Otherwise look for a chemical paint stripper. Best of luck on your project. 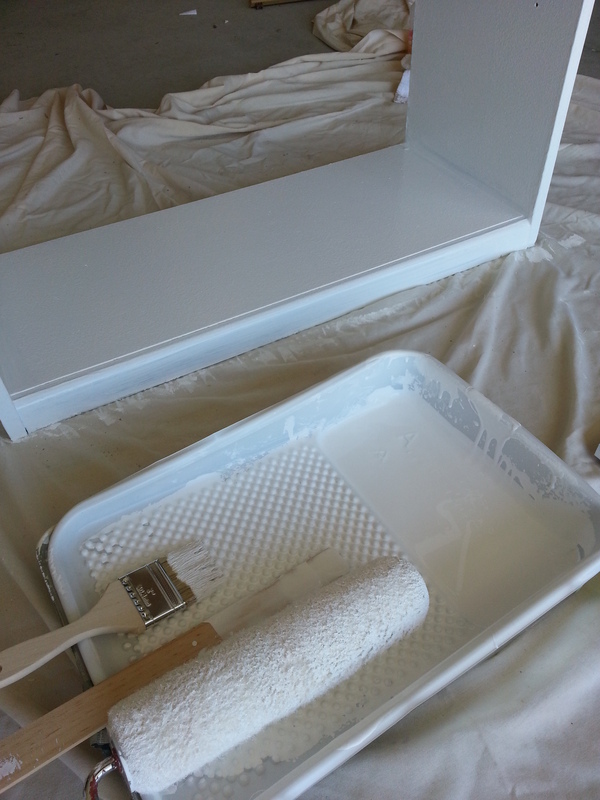 I am getting ready to paint my old Sauder bookcases. I’m using black chalk paint and leaving the oak top and shelves as they are. The back of my bookcases is, as usual, very cheap and flimsy particle board that has bowed over the years. 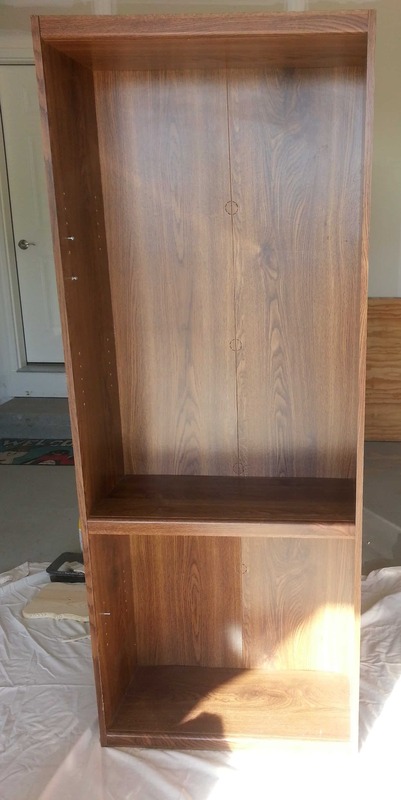 When you had the back of your’s out, did you notice how sturdy the bookcase was without it? I would like to just leave the back off so my white walls will show and brighten the shelves up a bit but I’m wondering if the case will be wobble without it. The backing on my bookcase doesn’t do much to hold it up. I am glad I put it back on because it’s in my kid’s playroom and the back keep little stuff contained. I would give ti a try and see how it holds up, best of luck with your project. Really well, and this bookshelf is in our playroom so it gets a lot of use. It has a few knicks from kids toys but I would expect that with any piece of furniture.